Detects anomalies in the input time series data. This article describes how to use the Time Series Anomaly Detection module in Azure Machine Learning Studio, to detect anomalies in time series data. The module learns the normal operating characteristics of a time series that you provide as input, and uses that information to detect deviations from the normal pattern. The module can detect both changes in the overall trend, and changes in the magnitude or range of values. Detecting changes in time series data has wide applications. For example, you could use it for near-real-time monitoring of sensors, networks, or resource usage. By tracking service errors, service usage, and other KPIs, you can respond quickly to critical anomalies. Other applications include health care and finance. Anomaly detection is the problem of finding patterns in data that do not conform to a model of "normal" behavior. 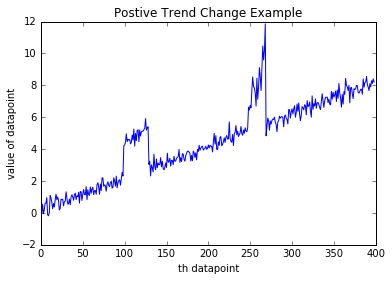 Typical approaches for detecting such changes either use simple human computed thresholds, or mean and standard deviation to determine when data deviates significantly from the mean. For example, the number of requests on a web service might bestable for some time and then dramatically increase. For example, a persistent upward trend in the length of a service queue might indicate an underlying issue. Even though the overall trend is consistently increasing and therefore might be considered stable, a change in slope could be flagged as an anomaly. Conversely, if you are monitoring memory usage of a server, a constant decrease in free memory size might indicate an issue. For example, assume you have been monitoring the number of requests per day to a web service over a period of time, and the number of requests appears to stay within a certain range. However, after an update to the web service, the number of requests to that web service changes. The new trend might be either higher or lower than the original trend; both upward and downward spikes can be detected. For example, assume you are monitoring the length of a queue on a service support site. A persistent upward trend might indicate an underlying service issue. In other cases, a persistent negative trend might be the anomaly. For example, if you are monitoring memory usage on a server, when free memory size shrinks, it could indicate a potential memory leak. Vladimir Vovk, Ilia Nouretdinov, Alex J. Gammerman, “Testing Exchangeability Online”, ICML 2003. Add the Time Series Anomaly Detection module to your experiment and connect the dataset that contains the time series. The dataset used as input must contain at least one column containing datetime values in string format, and another column that contains the trend values, in a numeric format. Other columns are ignored. Because each row corresponds to a data point in the time series representing the value at that time, the time values should be unique. Data Column: Select a single column in your dataset that contains numeric data values. These values are the data points in the trend that you want to model, such as population totals over time, costs per month, or temperatures over some period. Time Column: Select a single column in your dataset that contains the associated time series value. The column must contain valid datetime values, meaning that all dates must be within the range of dates supported by the .NET Framework. The Time column must use the DateTime data type. If your dates are in string format, you can cast them using the Apply SQL Transformation module, or convert them using the Execute R Script module. If your dates are represented as integers, you must also use an appropriate datetime conversion function to represent the values using a valid datetime format. After the date values are in the correct format, use the Edit Metadata module to set the column type to DateTime. Martingale Type: Select the martingale function to use. PowerAvg. This option is a marginalized implementation of the power martingale. The default value is PowerAvg with no additional parameters. This option gives a more stable anomaly detector and should be suitable for most needs. Power. A non-marginalized implementation of the power martingale. The Power option provide users with the option to provide a value between 0 and 1 for the Epsilon parameter to control the sensitivity of the detector. Generally, a higher epsilon value means higher sensitivity to anomalies but less certainty. This is the default, and is mostly used for detecting level changes. SlowPosTrend. Choose this option to detect positive trend changes. SlowNegTrend. Choose this option to detect negative trend changes. Length of Martingale and Strangeness Values: Specify the size of the history window, which is used to compute martingale values over the look-back history. The default value is 500, but you can specify any integer between 0 and 5000. For large time series, the default value should work well. For smaller time series, you can try to estimate the value for the expected length of the abnormal behavior. We recommend that you generally set these two parameters to the same value. Length of Strangeness Values: Specify the length of the history window used to compute strangeness at each data point. The default value is 500, but you can specify any integer between 0 and 5000. This parameter has the same restrictions as Length of Martingale. That is, you should set the value to the estimated number of data points that are needed to learn "normal" behavior. The default of 500 works well for most cases, but if the scale over which "normalcy" is measured varies, it might be beneficial to make Length of Strangeness Values a greater value than Length of Martingale. For example, if you are monitoring errors, and assume that data points are captured at 15-min intervals, the time needed to learn the normal trend might vary greatly from month to month. In general, using a larger window size leads to slower performance, because the module has to learn over a larger dataset. Alert Threshold: Specify a value above which the anomaly score generates an alert. A lower threshold would make the detector more sensitive to anomalies and generate more alerts. A lower threshold might result in normal changes being misclassified as anomalies. Note that you do not need to train this model separately; the algorithm learns the pattern from the data you provide as input to this module. When training is complete, the module outputs a time series that is the same length as the input time series; however, two columns are added to indicate values that are potentially anomalous. Anomaly Score: The first column contains a score that represents the likelihood that the time series value is anomalous. Alert: This column contain a flag with a value of 0 or 1, where 1 means that an anomaly was detected. You can set the threshold for generating the alert based on the score column, but setting the Alert Threshold parameter. The following examples demonstrate how to set the martingale function to detect anomalies and how to interpret the results. To illustrate the impact of different settings, the example dataset used in this example consists of 8870 data points, with three level changes. Based on this data, we created two models, using the following parameters. The model was trained on the incoming data, but a different value was applied for Alert Threshold. The results of prediction are plotted in the following images for Model 1 and Model 2. In these graphs, the blue lines represent the data values, and the red lines represent the alerts raised for an anomaly. In this model, the threshold value is lower, and therefore alerts are raised (anomalies detected) even when the changes are momentary. Depending on the type of time series you are monitoring, some of these alerts might be considered false alerts. However, a lower threshold might be preferable if you cannot afford to overlook any anomaly. In this model, the alert threshold was much higher, and as a result, the model detects only those changes that persist longer. A higher threshold for alerting might be more desirable in a scenario where you only want to catch more long-lasting changes. To illustrate this option for anomaly detection, we used an example dataset containing 300 data points. All the points formed a positive trend overall, with two anomalies. Again, we created two models using parameters that were identical except for the alert threshold value. 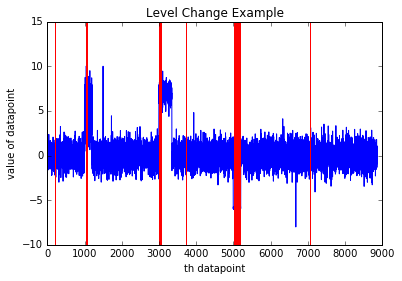 In these graphs, the blue lines represent data values and the red lines represent alerts raised for an anomaly. We recommend that you experiment with different alert threshold values to find the appropriate level of sensitivity for your anomaly detection scenario. Input data containing time stamps and values Data Table Input data containing date-time stamps and values. Time series annotated with anomaly scores Data Table Dataset with anomaly intervals.